E.C. : You guys used to have a doo-wop group, right? How did you make the jump from a doowop group to your present incarnation with social satire? E.C. : Did you always have humorous satire songs or did you start out writing serious stuff? DaVinci's Notebook: We didn’t always have them persay…we were doing mostly covers when we started, but even those were funny. 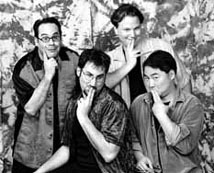 One of the groups we covered a lot is the acapella group out of San Francisco called The Bobs who do humorous original songs, and Moxy Fruvous who’s from Canada. E.C. : How do you feel about the comparisons between your group and artists like Bobby McFerrin and Weird Al? DaVinci's Notebook: Anything that will help people understand what we do is welcome. Bobby doesn't think its very funny. DaVinci's Notebook: Yes, that will work, we'll take that! E.C. : Will you guys ever branch out into video as a way of extending the humorous aspects of the songs? DaVinci's Notebook: Funny you should say that, we’re actually working on doing a concert video. If any major network were to pony up the bucks to do any kind of thing we would certainly find something. Or even a minor network for that matter (laughs). DaVinci's Notebook: Ahh...no plans for a giant phallus! We want to leave everything to everyone's imagination. We can rent the one from the Beastie Boys! E.C. : Have you ever been hit with threats of lawsuits for any of your songs? E.C. : Have you gotten any feedback from anyone mentioned in the songs, like Billy Joel or Heather Graham? DaVinci's Notebook: No, we haven’t gotten any feedback from any of them yet, let’s leave it at that. E.C. : Have you guys ever thought about doing a serious album at some point or is the humorous stuff working for right now? DaVinci's Notebook: Not to force this on you, but I resent the impression that our material lacks legitimacy of some kind just because it’s funny. The truth is, I had a rock band for nine years doing serious stuff, and I didn’t do squat or go anywhere. So I mean, we have a niche and we love what we’re doing and we’re haviung fun with it. We’ll follow it wherever it goes, but for now, this seems to be what our audience likes. E.C. : Is there any topic that’s off-limit when it comes to writing your songs? DaVinci's Notebook: There’s certainly stuff that probably can’t or shouldn’t be joked about, it’s a case by case kind of thing. We try to keep an eye on where the line is and try to get right up to it but never really cross over it. Generally we do more commentary about the cultural as opposed to the political. We’re not trying to piss people off, we’re just trying to make people laugh. DaVinci's Notebook: They come from all sorts of things. We’re just coming from four different points of view and we’ve been in different bands for long periods of time and we’ve traveled, and you just brainstorm with a whole bunch of different ideas. E.C. : A lot of your vocal arrangements remind me of the Beach Boys around 1967 with the SMiLE album; have you guys ever thought of doing a parody of any Beach Boys songs? DaVinci's Notebook: We have one actually, it’s off of our second album called "Seaside Lament". That’s inspired by that era. We’ll probably take another swing at it some other time too. DaVinci's Notebook: We thought about it, but I think that appeals to a pretty narrow audience, although that narrow set of people would love that. Though we have been known to do like Banana Splits and stuff like that, just randomly onstage. E.C. : Do you improvise or use a set list on stage? DaVinci's Notebook: Yeah we have a set list but we like to keep things fresh for ourselves and for the audience, for example one of the things we do in concert is we take audience requests and that keeps us on our toes. No matter what it’s always going to be a different show for the audience, and sometimes it falls flat and most of the time it works really well. E.C. : You have a four-part harmony, so for the requests do you just set it up so one of you always sings the low parts, another the highest parts and so forth? DaVinci's Notebook: Bernie tends to do the bass, but after nine years together we sort of know where we generally fall so it’s almost instinctual at this point as to who goes where, or we’ll arrange it by who knows the lyrics to the songs. E.C. : How did you come up with the name, DaVinci's Notebook? DaVinci's Notebook: You’d think there’d be a good story behind that, that it’d have some sort of meaning, but really we’d just spend a lot of time wheit we were supposed to be rehearsing sitting around trying to come up with cool band names. You go through a bunch of two-word names and eventually you end up with ? DaVinci's Notebook? And our first album cover was inspired by his art and we have a logo that we have for our latest album, but we don’t want to be locked down to his art. E.C. : Do you see this band having the longevity of artists such as Weird Al? How long to you plan to go on? DaVinci's Notebook: As long as we’re having fun and people keep coming, our bills are met and our families don’t kill us.